Working one to one or in a small group gives you the full attention of the teacher. In fact Yoga was traditionally designed to be taught in this way. Private sessions are best way to ensure your practice is accurately tailored to suit your individual needs. Whether it be to begin your Yoga practice or deepen your existing one, improve flexibility or work on specific goals, Hana can design a program and support you in your practice every step of the way. A consultation discussing your requirements and any goals or specific results you would like to achieve from you practice. Advice and assistance on suitable equipment and location/arrangement of your home practice area. Sessions are offered in monthly block bookings in order to allow a consistent level of practice to achieve the maximum benefit from your practice. Normally sessions are held at your home. If you would like a session in a studio, the studio hire will be addition to this rate. Hana has 13 years experience of teaching and is a British Wheel of Yoga Foundation Course Tutor, a Senior Yoga teacher with Yoga Alliance and currently is a mentor for students on a BWY Diploma Course. A one to one approach of working together is something she passionately believes in, as she has seen her clients reap the benefits of Yoga delivered in this way over the years. 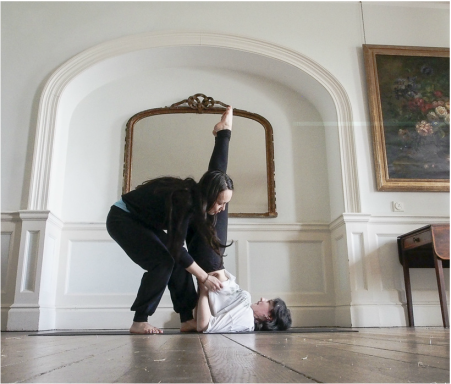 Many of Hana's long term private clients have improved their physical and mental wellbeing, recovered from stressful times or injures and some have even gone on to full time professional dance training (dance students) and Yoga teacher training. Please get in touch using the form below and we will get back to regarding rates and current availability. If have any questions at all or would like to discuss over the phone, please leave your number and a convenient time to call and Hana will get in touch.